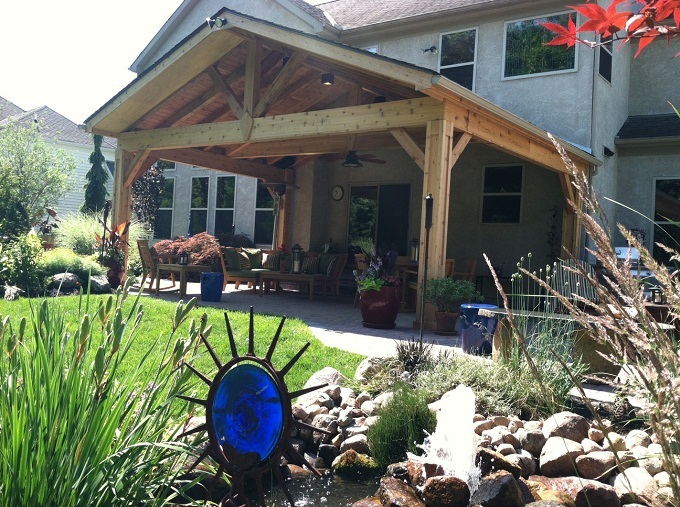 Archadeck of Columbus discusses the popularity of rustic wooden outdoor structures. 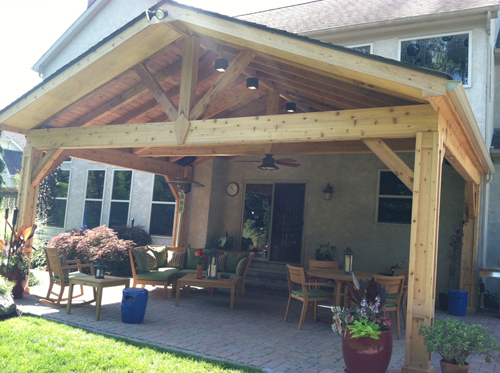 Notice the rustic character of the knotty wood used in the interior of this screen porch in Columbus, Ohio. Thumb through any home and garden magazine and you will see the allure of vintage inspired rustic wood. It is evident through the deliberate efforts to make new furniture look old. It is also evident through the continued use of reclaimed materials in home building and furniture design. Reclaimed materials are given a new lease on life in a design world where everything old is new again! It is clear that the older wood appears, the more appealing it becomes. The appeal of “rustic chic” extends into the realm of outdoor living designs as well. Homeowner’s want their new deck to look old, and some are making the choice to use wood in lieu of materials that display no imperfections. 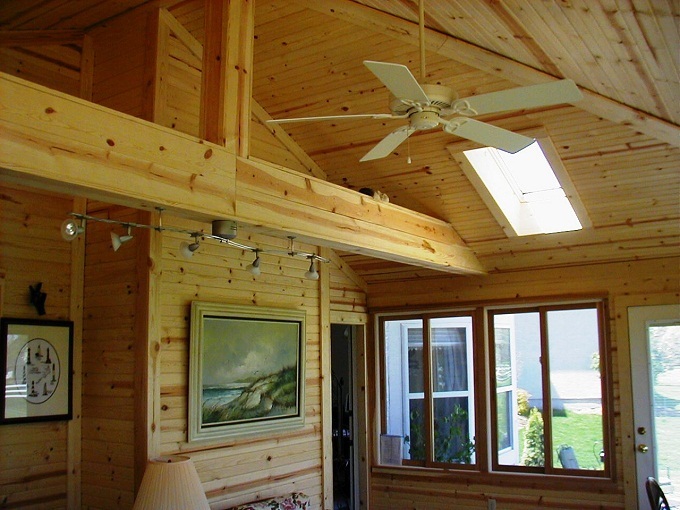 Cedar is among the most commonly requested wood for exterior applications. Design trends come and go, but the attributes associated with wood have never gone out of style. Wood is coveted for its rustic appearance and its natural flaws. Streaking, veining, knots and even worm holes are all appealing aesthetics of wood. Many times the more knotted the wood is, the more people want it. Knots create more of a visual sense of the natural state of the wood. The more rustic the wood appears, the more character the wood has. When you look up the definition for the term “rustic” it reads made of the rough limbs of trees. This explanation defines rustic and speaks volumes about the characteristics homeowners are looking for when they make the choice to use wood. An outdoor fireplace adds to the rustic charm of this wooden screened porch in Deleware, OH. Many times clients will call and tell me there wood has some checking. Checking is a natural part of wood’s aging. Checking can safely be as much as six inches long. Wood is natural and porous and therefore it is expected to expand and contract. This is why clients choose wood. These are the elements that give the wood character. By the function of wood aging you get some rustic appeal like checking. Knottiness in wood also delivers a rustic appearance. Clear wood which is made from the innermost part of the tree is less likely to contain knots, but is a lot more expensive. Different grades of wood will display different degrees of knottiness. The knots should not be of concern because they are part of the timber, are tight and will not fall out. Rustic timbers help enliven this open porch design. The very nature of certain types of wood lends itself to a rustic appearance. Cedar and pine are commonly used in outdoor structure design. Pine is more yellow where cedar is more gold. Pine is a softer wood than cedar and will expand and contract more than cedar. Cedar naturally contains oils that won’t allow for as much expansion and contraction as pine. Ipe’, even though it is a dense hardwood will weather to a rustic grey patina if left alone. 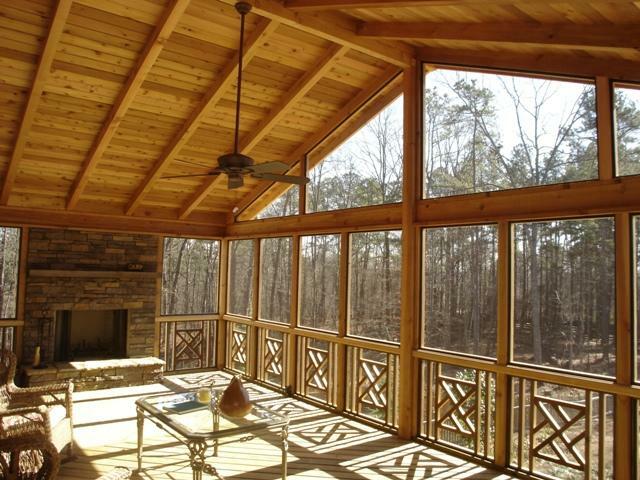 A king truss, and heavy wood graining add to the cabin allure of this screened porch. The popularity of wood with more character has come full circle. Thirty years ago, redwood was the most popular choice for decks. It was a status symbol to own a redwood deck. Over the years mahogany and cypress have both had some popularity. 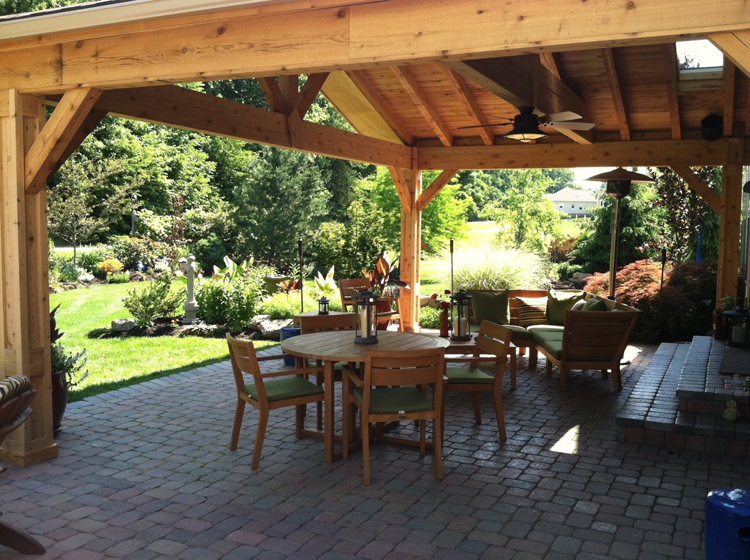 Cedar has been popular for many years and today is still our most commonly requested wood in outdoor designs. So you see everything old is new again. 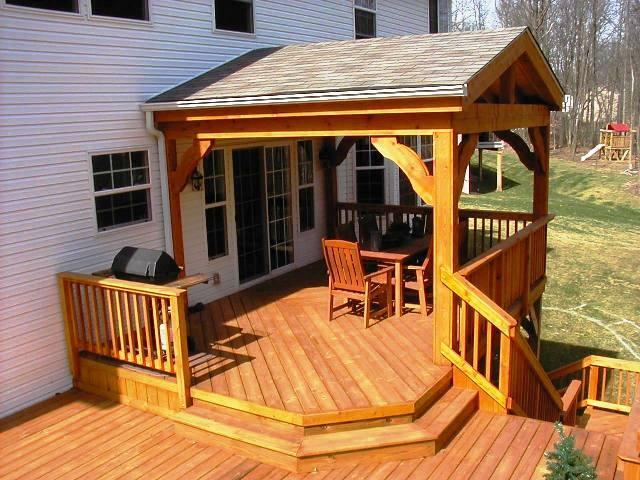 You can see more examples of outdoor spaces with character and charm by visiting our extensive wooden deck gallery, and our porch galleries located on our website. Archadeck of Columbus turns the spotlight on a versatile combination of outdoor structures in Columbus which includes a rustic open porch, and patio with separate seating area. The perfect match for the outdoor living season. Open porches take us back to a time when you spent the summer afternoon sipping lemonade while rocking away the time on the porch in the company of friends and family. Open porches sure have changed and evolved. Once upon a time an open porch was only a front of the house, or back of the house thing. Today’s open porch designs include detached, open gables, intricate ceilings, and many other “goodies” hidden inside. Open porches now include many different convenient amenities such as outdoor kitchens, lighting, ceiling fans, fireplaces and even televisions. Notice the stunning keystone centerpiece within the open rafter end. This adds character and rustic appeal to the appearance of the porch. 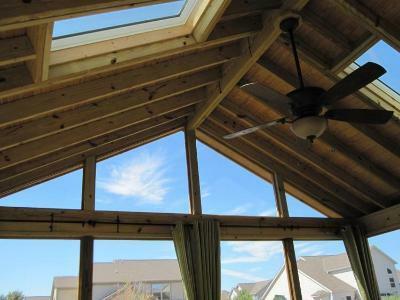 This open porch we recently completed has an open gable roof to allow lots of sunshine to enter the area. The gable includes a stunning decorative element called a keystone centerpiece. The homeowner wanted to use a minimal number of columns so they could utilize the open area more efficiently; therefore we used four columns in the porch’s construction. In doing so we had to engineer the size of the beams to take care of the abundant span on this 17 x 21 area. Along with the keystone used on the rafter, we also used a keystone on the king truss. The large king truss serves two purposes; aesthetic appeal and the ever important structural support. 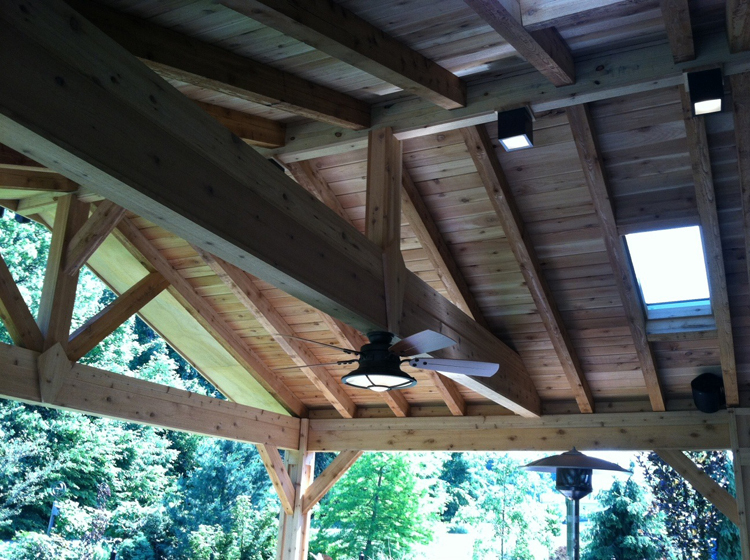 We were also able to hang the ceiling fan from the king truss to provide further visual interest, and more function. Since the homeowners specifically asked for intricate details and plenty of lighting in their new open porch, we wrapped everything in rustic cedar. The rustic touches can also be seen in the use of the large 4 X 6 rafters we used. We included lots of lighting including skylights, and lighting on the ridge beams as well. The king truss adds loads of structural support and beauty. The beauty and function doesn’t end with the open porch. We also built a patio below with a separate seating area, built with unilock pavers. This multi-structure outdoor area serves all the purposes the homeowners desired and then some. These Columbus, OH homeowners are looking forward to many lazy afternoons on their new open porch, from lemonades to entertaining, the world is the limit. See more stunning open and covered porch designs by visiting our covered porch and front porch photo galleries located on our website.